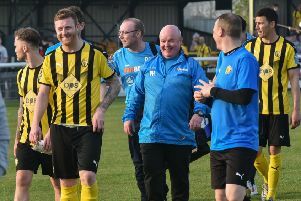 Leamington chairman Jim Scott says it is not a foregone conclusion that Brakes will be in the Conference North next season. North Ferriby, York and Southport will all have to be accomodated in the division after relegation from the Conference National and although Brackley and Gloucester look favourites ahead of Brakes to make the switch South, Scott is not getting ahead of himself. Leamington chairman Jim Scott with Paul Holleran. “It’s not 100 per cent certain it will be the Conference North, though I think it may well be,” said Scott. “We’re on the cusp and there are three coming down from the National League to the North which means an extra team coming down. “My belief is that one team will be going South and I think that might be Brackley but it could be two teams. “I’m not sure. And then there are teams that might go into administration or fail to meet the financial guidelines. “My preference is to go into the North. It will be far harder but far more exciting for the supporters. “There were 11 teams averaging over 1,100 in the Conference North and three or four averaging over 2,000. “With the Conference South there are a lot less fans. Whatever division Brakes find themselves in, Scott is hoping additional supporters who made up a record crowd of 2,102 can be retained. “The support was phenomenal. We haven’t done well in cups and they build momentum and attract fans.